"Everything about the latest edition in this series is bigger, better, more useful, and more likely to result in real change than anything that has come before!" This, according to author Randy Kirk who says he has spent the last four years doing grass roots research for the new book. "I've interviewed a dozen owners of the top shops in the US. I've worked as a consultant for another dozen shops. Add this to over 30 years of working in the industry and writing four books and countless articles&the time was right for the next version." Kirk says that the new book is truly a 21st century product in that the printed words in the hard copy version will be backed up by online resources such as tutorials, videos, pictures of best-of-class examples, work sheets, standard templates and forms, and more. "It will also be evergreen. 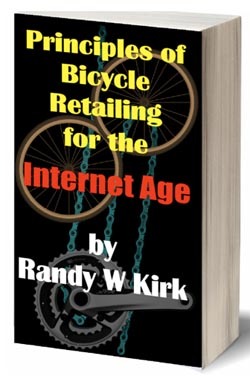 For a small monthly fee, the purchaser will have access to a member's only portal where bike shop owners and managers and industry suppliers can find the latest internet marketing approaches, new ideas, and even totally new chapters on subjects not in the book. Besides writing and speaking about issues effecting sales and profits in IBD's for over 30 years, Kirk is probably best known for the company he cofounded, AC International, maker of Mr. Tuffy, California Springs water bottles, and other products. "I sold the company in 2007 and began work on the book immediately. The section on internet marketing is as fresh as yesterday's Google Search results. The book covers every aspect of social media and local search engine marketing imaginable. There is even a section on how to create your own YouTube videos backed up by online video tutorials."